Google's headquarters in Mountainview, Calif., was one of the 10 stops during the Quinlan Ramble. 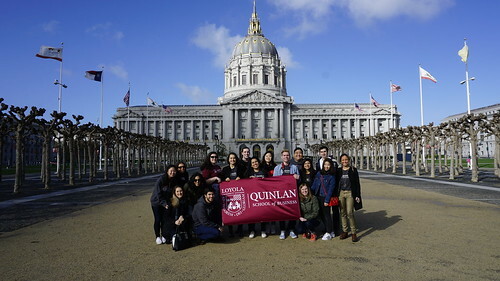 Fourteen students spent their spring break visiting leading companies in the San Francisco Bay Area during the third annual Quinlan Ramble. The Quinlan Ramble enables students to connect with Quinlan alumni and learn about the business community in another part of the United States. Previous trips visited Seattle and the Texas cities of Austin and Dallas. "The Quinlan Ramble San Francisco trip has been an extraordinary and life-changing experience," wrote student Azaria Urbiola ('16) in the Quinlan Ramble blog. "It was amazing meeting Loyola alumni that work in the Bay area, as well as other business professionals in all the different companies. The people in these companies were happy to welcome us, willing to share their experiences, and give us advice, and for that, I could not be more grateful."